News of the armistice engenders a certain levity among the Allied commanders. Haig and his army commanders discuss the practicalities of continuing the advance into the German occupation zone and the problems of keeping the men usefully employed now that the fighting is over. But then men from a cinema company arrives to film the generals; as they pose for the camera they start playing tricks on each other like a bunch of schoolboys. Pétain meanwhile marks the day by visiting a village theatre where soldiers and local civilians put on an impromptu performance. 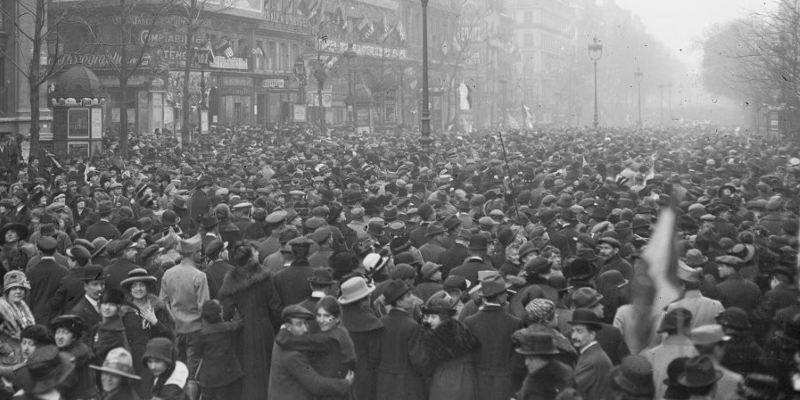 Pétain himself takes the stage to read the armistice communique to the delighted attendees. In Mons, liberated just this morning, there is an outpouring of emotion as a Canadian army band plays the Belgian national anthem, previously banned by the German occupation authorities. In Paris, after his meeting with Clemenceau, Foch retires to his apartment. Cheering crowds greet him but he is too exhausted after the final rush of the negotiations to join the celebrations. He sits alone smoking and thinking. The rest of the city gives itself over to a bacchanal. Paris explodes with tricolours and everywhere people are laughing, singing, embracing, and kissing. The conditions are perfect for the further transmission of the influenza. The Allied and German negotiators signed the armistice just after 5.00 am this morning but it does not come into effect until 11.00 am. As word spreads of the war’s imminent end fighting begins to trail off but before then fighting is surprisingly intense, with Allied troops either trying to capture symbolic targets or to secure advantageous positions in case the ceasefire breaks down and fighting is resumed. Canadian troops expend great efforts to liberate Mons, site of the first clash between British and German troops in 1914. By the time the guns stop firing it is in Canadian hands. American troops die taking the town of Stenay, apparently for no better reason than it has some excellent bathing facilities. People keep dying right up until 11.00 am (and possibly beyond, as some isolated units only discover that the war is over after mid day). There are reports of Allied artillery pieces continuing to fire on the Germans until the very last moment, simply because doing so will save them the bother of bringing the un-used shells home. There are a number of candidates for the last man killed. Near the Meuse river Augustin Trébuchon is bringing a message to frontline troops that hot soup will be served after the armistice comes into effect; then a bullet ends his life at 10.50 am. On the outskirts of Mons, Privates Arthur Goodmurphy and George Laurence Price are so far forward that news of the impending armistice has not reached them. Without orders, they move on further to investigate some abandoned houses. Then Price is shot and killed by a sniper at 10.58 am. American troops taking part in the last stages of the Meuse-Argonne offensive are still fighting this morning but again, as news of the imminent armistice spreads they mostly choose to sit tight until the ceasefire. Private Henry Gunther has other ideas. Previously a sergeant, he was demoted after complaining to a friend in a letter about army conditions, advising him to avoid being drafted. Now he seizes a last chance for glory and makes a solo bayonet charge on a German machine-gun post. The Germans try to wave him away but he keeps coming and fires his gun before the machine guns cut him down, one minute before the armistice takes effect. The last German deaths appear not to have been recorded. In total both sides suffer some 11,000 casualties today, of which roughly 2,700 are fatalities. When the guns stop firing there does not appear to be much in the way of fraternisation between the two sides. There are reports of German soldiers waving towards their former enemies before beginning their long march home. Lieutenant Clair Groover of the US army is unusual in that he does meet a German today. A tearful German soldier approaches him, saying that his brother was killed yesterday. The German asks for permission to find and bury his brother’s body. In Compiègne Forest German and Allied negotiators have been trying to conclude an armistice that will end fighting on the Western Front. The Germans have been shocked by the severity of the terms the Allies are offering. Yesterday though Erzberger, the lead German negotiator, was directed by Ebert, Germany’s new Chancellor, to sign whatever terms he can get. Revolution is now spreading through Germany and the army is disintegrating; if the war continues then chaos and anarchy will be the result. Ebert’s authorisation led to an intense burst of negotiations. Finally just after 5.00 am today the two sides reach an agreement. The Germans were unable to persuade the Allies to significantly improve their terms, though they did win some concessions. Foch and the Allied negotiators now accept that Germany will not have to surrender more U-boats than it actually possesses. They allow the German army to retain a very small amount of its military capacity in order to combat internal disorder. The Germans also win a slightly longer window in which to evacuate their troops from occupied territory. Fundamentally though the armistice terms are dictated to the Germans by the Allies and are designed to prevent any resumption of hostilities by them. The German army is to surrender almost the entirety of its artillery pieces, mortars and machine guns, as well as huge numbers of trucks, locomotives and train carriages. The Germans have 15 days to withdraw from Belgium, Luxembourg and France (including Alsace-Lorraine) and must then withdraw their forces 40 kilometres east of the Rhine. The Allies will occupy the west bank of the Rhine and bridgeheads across it, with the right to seize any property they need from the local population. Germany’s navy will completely disappear, its warships and U-boats sailing to Allied ports for internment, pending a final decision on their fate. The armistice nullifies the unequal treaties Germany signed with Russia and Romania earlier this year. German troops are also to be withdrawn from all the territories it has been occupying in the east. And Lettow-Vorbeck‘s army in Africa is to surrender. All prisoners of war held by the Germans are to be repatriated. The Germans had hoped that the armistice would mean the end of the blockade of their ports, but this is not to be. The armistice states that the blockade will continue until a final peace settlement is agreed. For Erzberger this is a particularly egregious provision. He reads out a formal note of protest before signing the armistice, warning that the terms will unleash famine and anarchy in Germany. Yet his concluding words are defiant: “A nation of seventy million people suffers, but it does not die”. Germany is in a state of flux. Ebert is now the Chancellor of a republic, the Kaiser having fled to Netherlands this morning. In the Chancellery he receives a telephone call on a secret line from Groener at army headquarters in Spa. Groener promises to support Ebert’s government; Ebert in turn promises to suppress the more extreme revolutionary elements and to respect the prerogatives of the army’s officer corps. Ebert also receives the armistice terms that Foch presented to Erzberger in the Compiègne forest. The terms are harsh but Ebert knows that Germany cannot continue the war. He authorises Erzberger’s signature of an armistice on whatever terms he can obtain. The armistice negotiations now enter their final lap. On the Western Front the Allied advance continues. The Germans are mostly retreating rather than fighting and the Allies are being slowed more by the booby traps and destruction the Germans have left behind than by German resistance. Nevertheless the recovery of Belgium continues, with Tournai and Ghent today liberated by British and Belgian troops respectively. In the forest of Compiègne armistice negotiators are trying to bringing the war to an end. The German team is still reeling from the unexpected harshness of the terms presented by Foch yesterday. Now Erzberger, the lead negotiator, asks again for an immediate ceasefire so that the German army can be deployed home to prevent revolutionary chaos. Foch brushes him off once more: German disorder is a problem for Germany and there can be no ceasefire until all the terms are agreed. Erzberger for his part is still waiting for word from Berlin as to whether the terms can be accepted, so he is unable to agree the Allied terms. The war therefore will continue. Led by Erzberger of the Centre Party, the German armistice negotiators have crossed the lines and boarded a special train. Now after a long journey that seems calculated to show them the devastation their army has wreaked on France they arrive in a forest clearing where Foch, Weygand and the Allied negotiators are waiting for them. 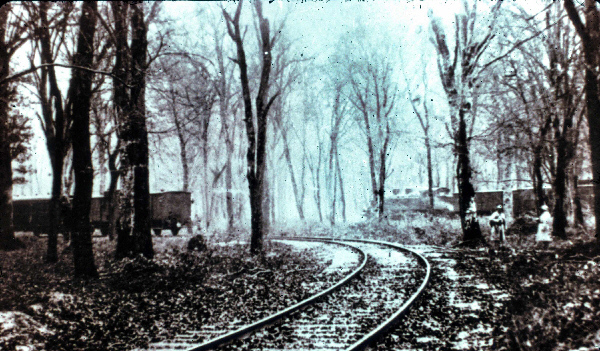 The armistice negotiations will take place in these woods near Compiègne. Proceedings begin with Foch reading the terms the Allies have agreed. They require the Germans to surrender large quantities of military materiel and to completely evacuate France and Belgium. The German fleet and its U-boats will also have to sail for internment to Allied ports. And the Allies will occupy Germany up to Rhine, as well as bridgeheads across the river. The British navy’s blockade of Germany will not be lifted until a final peace settlement. The terms are clearly intended to make it impossible for the Germans to treat the armistice as an opportunity to rest and regroup before continuing the war. Erzberger nevertheless asks for an immediate and unconditional ceasefire, so that the German can be deployed at home to restore order in a country where revolution is on the march. But Foch rebuffs him; the war will continue until the armistice terms are agreed in full. One of the Germans leaves to bring the Allied terms back to army headquarters at Spa. Foch then leaves the German delegation to their deliberations. Wilson‘s latest note told the Germans that Foch had been authorised to present armistice terms to a German delegation. The way is therefore clear for the war’s conclusion. Prince Max, the Chancellor, was initially wary of seeking an immediate ceasefire but his mind has been concentrated for him by the revolutionary chaos spreading in Germany. Groener meanwhile has warned that the army is on the brink of collapse. French and American troops have finally reached Sedan; without this vital rail hub the entire German position in France becomes untenable. The ability of the German army to continue resistance is ebbing away by the day. Prince Max persuades Erzberger to head the armistice delegation. Erzberger is the leader of the Centre Party, which represents Catholic interests. He had previously called for an end to the war, so Prince Max hopes that the Allies will treat him more favourably. Today under a white flag of truce Erzberger and his delegation cross the Allied lines. 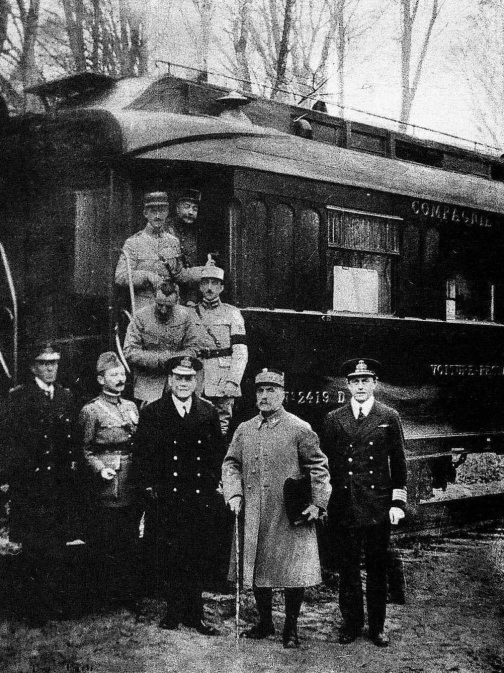 They are brought to a train that will transport them to meet Foch and his team.